Les Cailloux du Tech invite you to a rather lovely musical evening with Scarlett Deon on accordion, along with an ‘assiette gourmande’ and a glass of wine for just 15€. An evening in their shady courtyard to sing along or just to listen to some of the great French songs of the past. With a passion for quality and tradition, Les Cailloux du Tech is run by Christine & Armand. 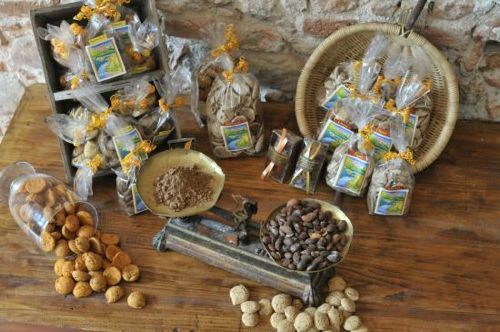 Their speciality is the local Roussillon almond which features in no less than 30 varieties of their biscuits. Both classic and unusual, only natural and traditional ingredients are used. Situated in a leafy courtyard, tucked away high up in the old town of Elne (near the cloisters and church), why not call into this tearoom on a bright spring day for a warming drink and a chance to try the delicious biscuits? (and even watch Armand at work making them!). Just a mouthful, they come in a range of flavours – chocolate, orange, lemon – but also strawberry, apricot, apple … The all-so-delicate lavender and rose are not to be missed and it’s doubtful whether you’ll be able to resist the rather morish Marc de Banyuls! Fabulous with a coffee or herbal tea, they make a refreshing change. Those of you with a savoury tooth are not forgotten either – choose from chorizo, Desclaux anchovy from Collioure and vinegar flavour from Banyuls, amongst the most unusual. Ideal to go with your apéritif or simply tossed in your salads. Other Catalan specialities (including bunyetes, croquants and baby ginger cakes in a variety of flavours) are produced according to the season. Great for gift ideas too! 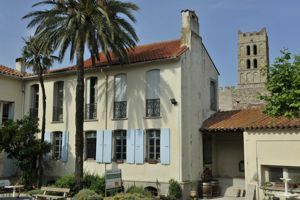 Whatever the reason, the next time you are in Elne, don’t forget to pay Christine & Armand a visit. You are assured of a warm welcome and Christine will be more than delighted to practise her English with you! PLUS – hire out the leafy courtyard for a special occasion!